There are opportunities for volunteers at GATE Herts as we are a charitable organisation. Together lets support, protect and maintain their cultural and traditional way of life. 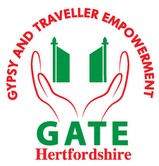 We are a membership organisation for Gypsy and Traveller people across Hertfordshire. Our aim is to improve quality of life for our communities. We work in partnership to address the issues which affect our accommodation, health, education and employment, and our circumstances within UK society.